By now you have probably figured out that I have a fondness for gigantic hostas, but I also go weak in the knees when it comes to a pie crust edge on a hosta. So there was no way I could resist adding hosta 'Choo Choo Train' to my garden, even if it meant having to get rid of some other hostas to make room for it. 'Choo Choo Train' is a gold hosta that is deeply veined and has an magnificent pie crust edge. It grows to be over 6 feet wide and about 2 feet tall. 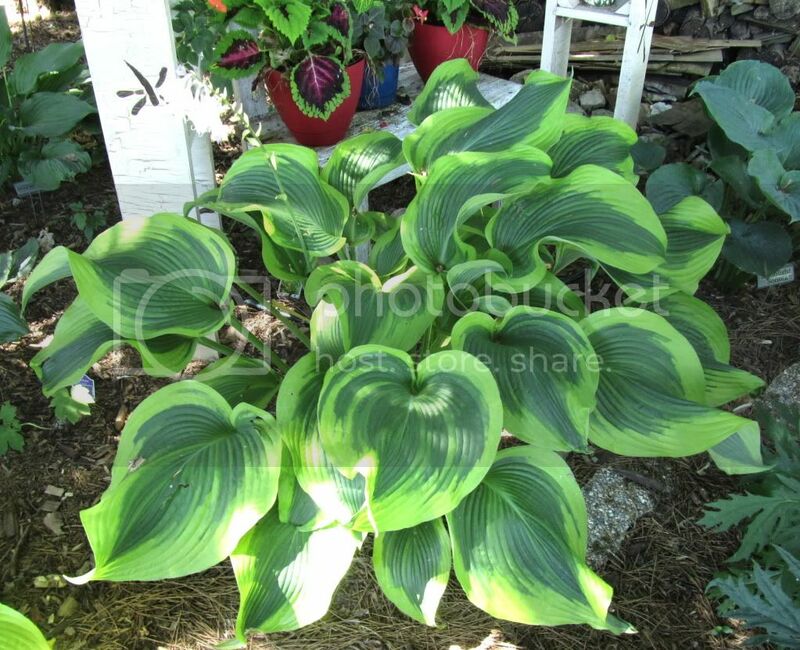 It make a great center piece or back of the shade garden hosta. 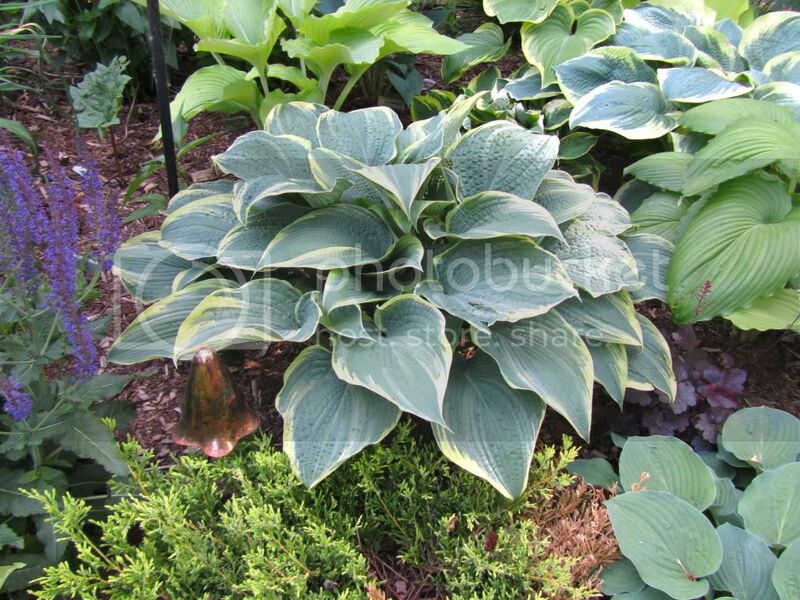 Because of it's gold color, it can also take a little more sun than green or blue hostas. Mine is only a couple years old, but you can see it's already going to be a beauty! Attention all of you Star Trek and hosta fans out there, if you want to add a little Trekian flare to your shade garden then hosta 'Captain Kirk' is a must have. Even if you are not a Star Trek fan, you'll be very pleased with this hosta. 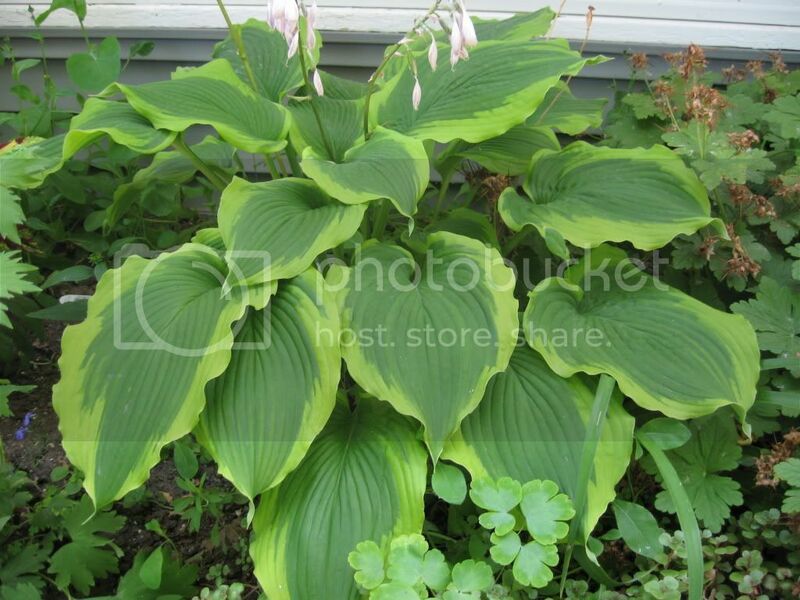 It is a medium sized hosta with wide green margins and a very prominent gold center. It's a fast grower. I had to dig mine up in 2009 and move it to another location. I also promised a friend a chunk of it. By last summer it was already back to being a lovely hosta. The leaves on 'Captain Kirk' are on the thicker side, so it's also another one to plant if you have problems with slugs eating your hostas. I'll finished off the week with a beautiful hosta. hosta 'Babbling Brook' caught my eye when I was at the closing sale of Foxfire Gardens in Marshfield. Even though it was a monster I dug it out myself to bring it home. What is there not to like about this hosta? It has silver colored leaves that are slightly ruffled. 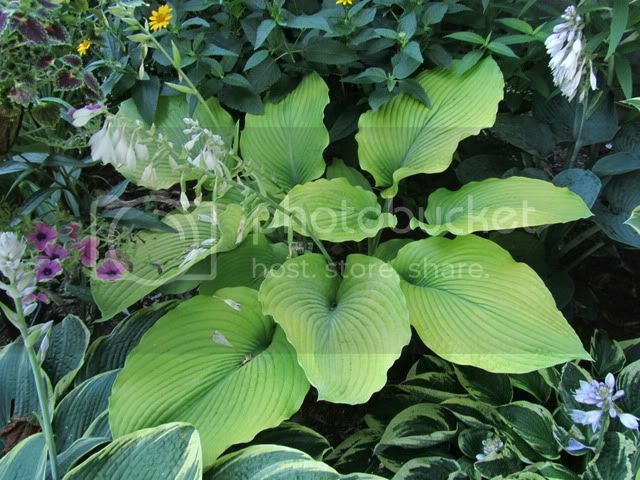 It definitely stands out among other hostas. Much like yesterday's hosta 'Blue Haired Lady' it also has leaves that are chalky white underneath. 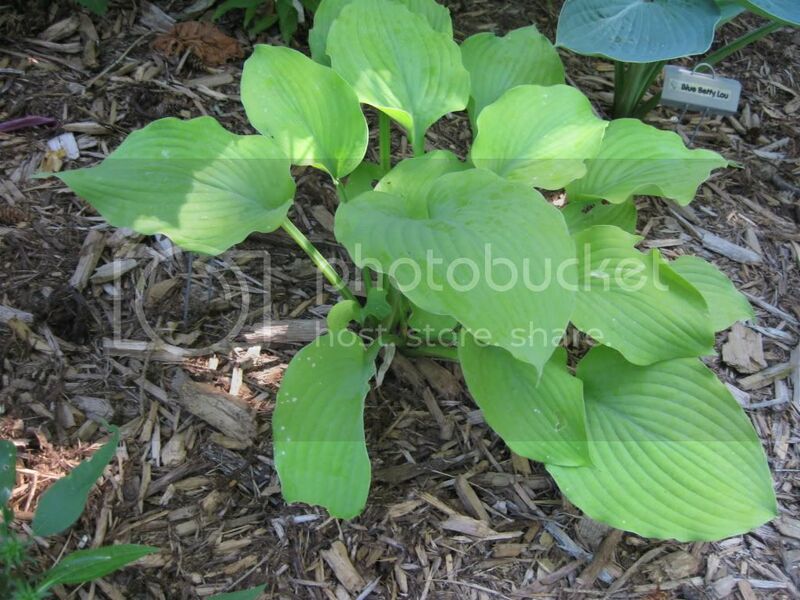 It's a fast growing hosta that has thicker leaves that would be more slug resistant. I'm not sure why, but this beauty is not easily found. So if you run across one in your travels - grab it and run (well pay for it first)! Today's hosta has both an unusual name and an unusual look. hosta 'Blue Haired Lady' has very smooth glossy leaves that have a slight waviness to them. As it matures it becomes more blue in color, but if you find an immature plant it will look more green. 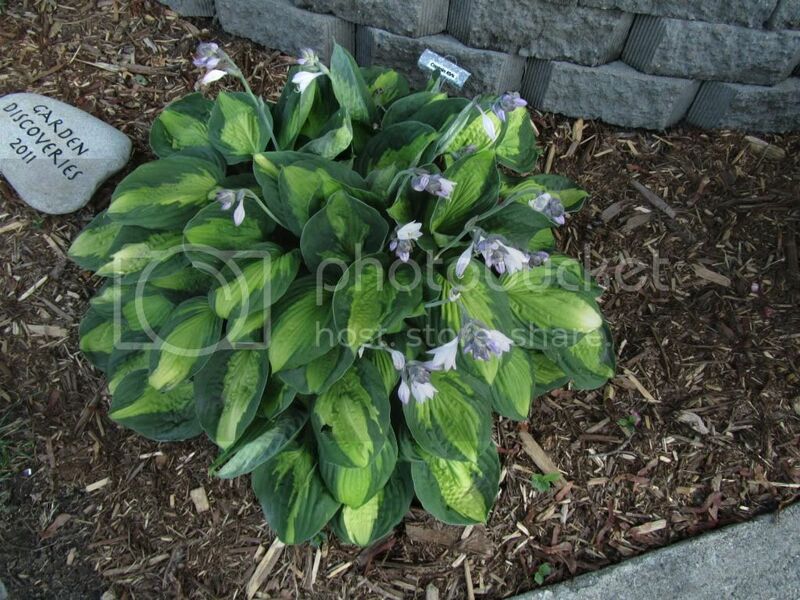 It has a close mounding habit, and is considered a medium hosta. Like all of the other hostas featured this week, it's leaves are very thick which makes them more slug resistant then other hostas. The undersides of the leaves have a chalky white appearance. Perhaps that is where the name comes from? Blue dye on the top, but underneath it's really grey/white? I started off the week with two miniature hostas, but today I am featuring another big hosta called 'Big Daddy'. I will admit that I bought this one at first just for it's name. It's a very slow growing hosta. It's also one of the slower ones to pop it's nose out in spring. Every spring I think I have lost it, only for it to pop it's nose out late. It has blue leaves that can grow to be over a foot, but the leaves will turn more green the more sun it receives. As you can see from the pictures, as 'Big Daddy' matures his leaves grow to be more crinkly and cupped the leaves become. This is another hosta that has very thick leaves, so slugs are more apt not to eat this one. 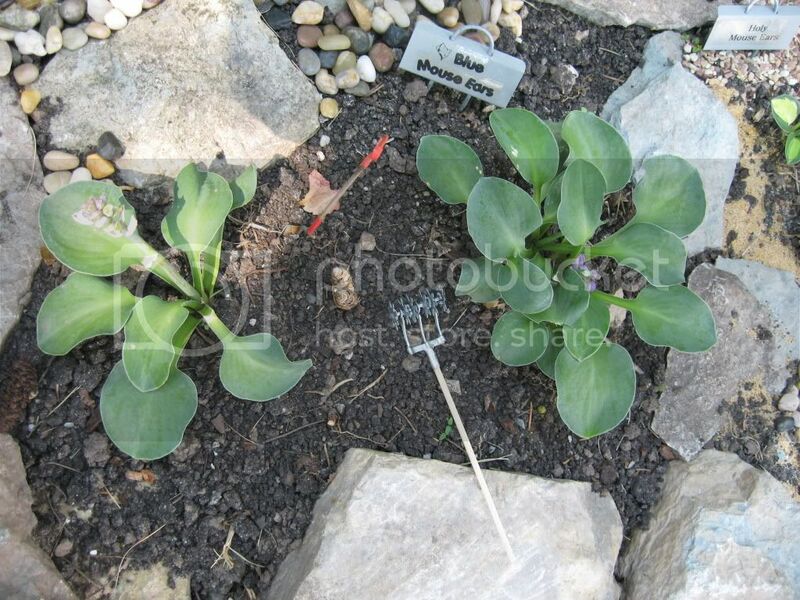 Yesterday, I featured the hosta 'Blue Mouse Ears'. Today I have one of the sports of 'Blue Mouse Ears' called 'Blue Mouse Ears Supreme'. Again this is a miniature hosta, and will grow to be about 3-6 inches high and probably about 8" wide. It has the same heart shaped leaves as 'Blue Mouse Ears' except instead of being blue green in color, it's blue green with off-white streaking. It also has the thicker leaves which make this hosta both more slug resistent and able to withstand more sun then some other hostas. 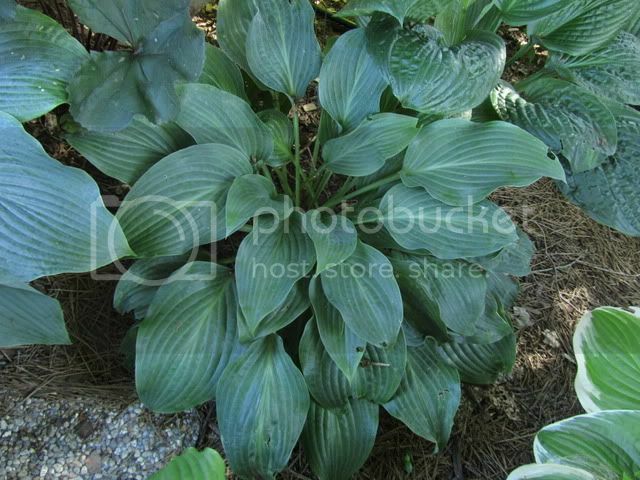 This one is not as widely available as the original mouse ears hosta, but if you find it, you will not be disappointed! 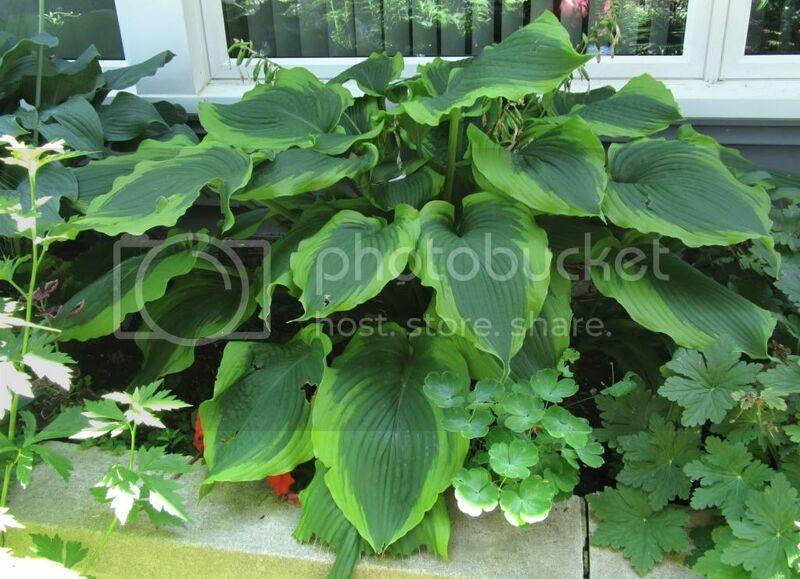 So far I have featured a lot of very large hostas in my hosta of the day series. However, today I am featuring a miniature hosta. 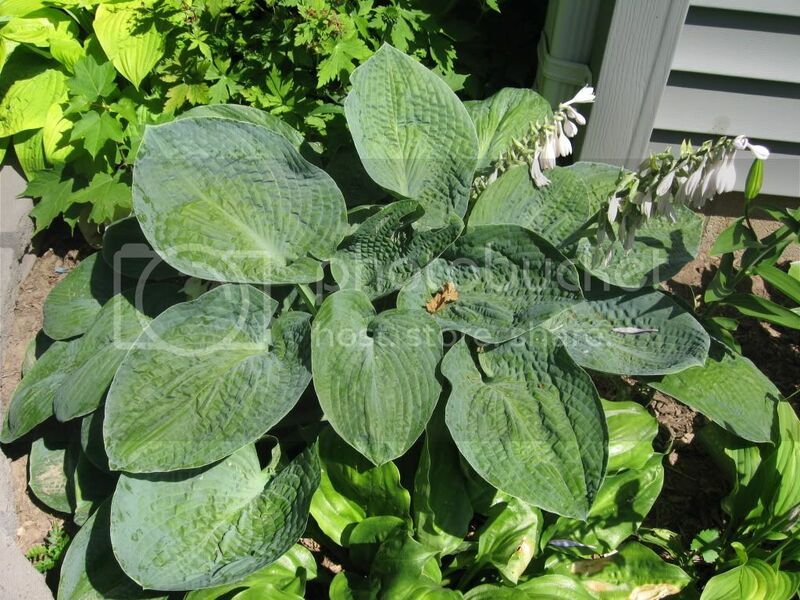 'Blue Mouse Ears' is a very thick leaved hosta, which makes it more slug resistent then other hostas. It features small heart shaped blue green leaves (it will stay more blue with less sun). This tiny guy usually grows to be about 3-4" tall (maybe more with flowers). Miniature hostas can be finicky, but this is not one of them. 'Blue Mouse Ears' is an excellent choice for those of you out there who are thinking of starting some miniature or fairy gardens of your own. It holds up well through most weather, sun, and anything else you want to throw at it. If there is one hosta in my garden that garners the most compliments, it is probably hosta 'Atlantis'. Why wouldn't it, with it's wide gold border on green wavy leaves. The leaves are pointy and with a slight twist. 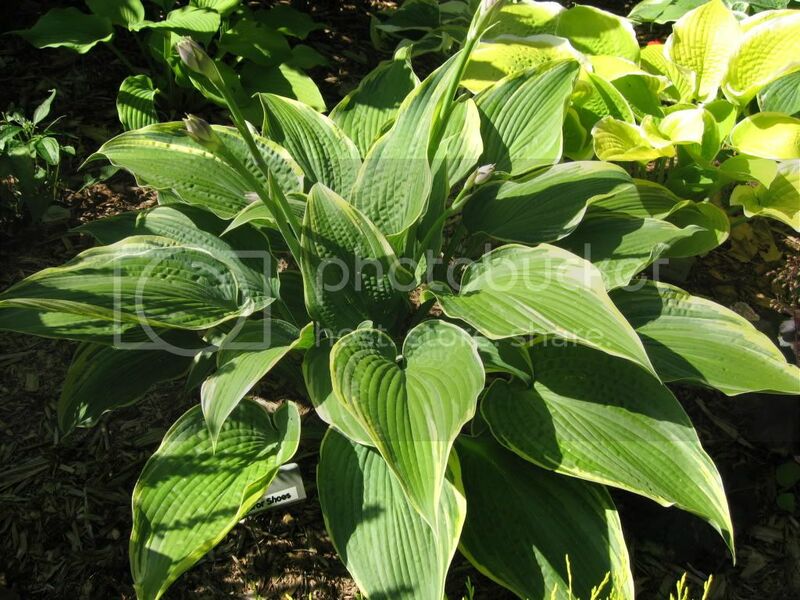 It's a very fast growing hosta, and makes a great statement hosta for your shade garden. It's another one that grows to be about 5 feet wide. Today's hosta is 'American Icon'. 'American Icon' is a very fast growing hosta in my garden. I am a sucker for any hosta with a pie crust edge (way edge), and this one does not disappoint. 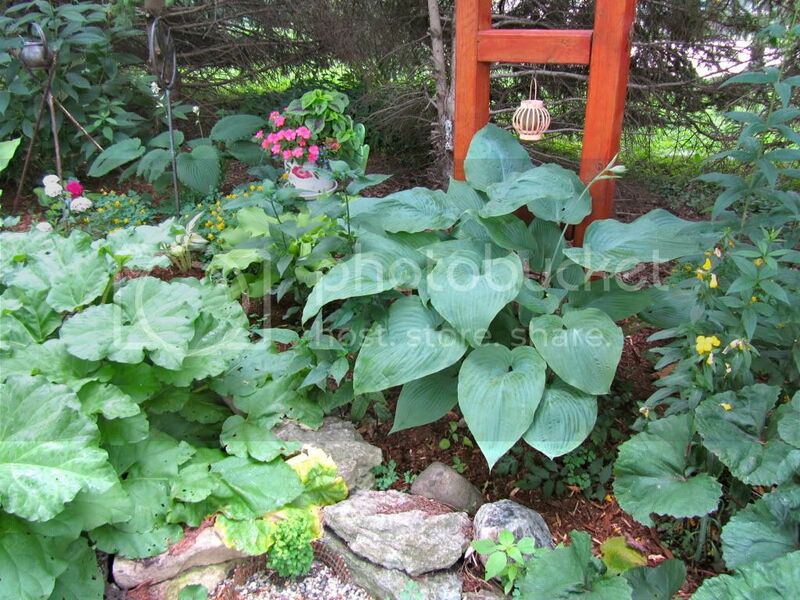 It's another huge hosta that can grow to be about 5' across. It has green leaves that have a wide border of gold/green. Today's hosta is a real beauty, but her true beauty takes time to be revealed. 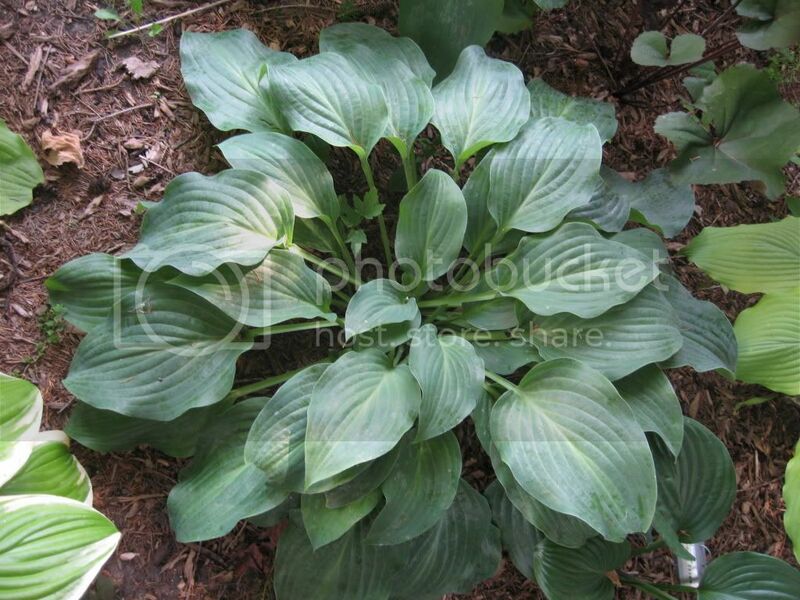 hosta 'Alligator Shoes' when fully mature has very pebbled blue green leaves with an ivory border. 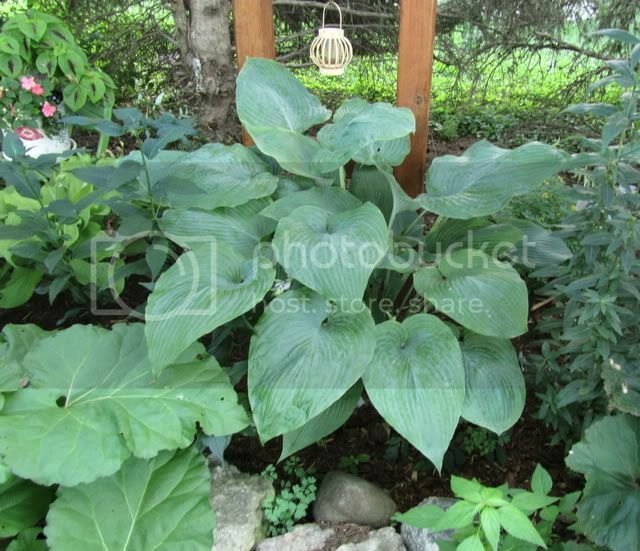 It's leaves are large, but are very pointed (because it is part of the Montana family of hostas) at the end. An immature 'Alligator Shoes' will have leaves that are more green in color and smooth. It's an average to slow growing hosta, but your patience with this one will pay off. This week I have featured a hosta with large leaves, a hosta that covers a large area, and I will close the week with a hosta that has a very large bloom. hosta 'plantaginea' has flowers that measure about 4" long. Just the size of the flowers make this hosta a must have, but there is the extra bonus that these flowers are also highly fragrant. The down side is that the flowers usually open late afternoon or at night, so during the day they will often look like the one in the picture below. The plant itself has medium to large heart shaped leaves that are glossy and green. The seeds it produces are very viable, and it is the parent plant of many other fragrant hostas. Today's hosta, hosta 'Squash Casserole' is another monster. Squash Casserole has medium to large leaves, but it can grow up to 4 feet wide! The leaves are chartreuse and are slightly wavy. The scapes can grow to be almost 2' tall with light purple flowers. It's definitely one that grabs people's attention! With the winter here, I've decided to showcase various hostas throughout the winter. Today's hosta is hosta 'Elegans'. 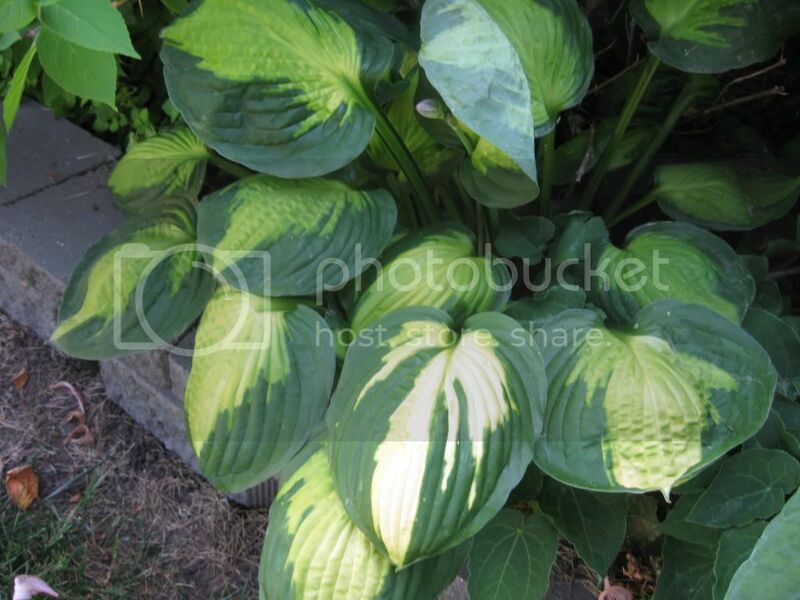 Elegans is a very large leafed hosta that is blue green in color. As the summer progresses it turns more green in color. The leaves are very deep veined and are "quilted". Elegans is one of the earliest hostas to bloom. 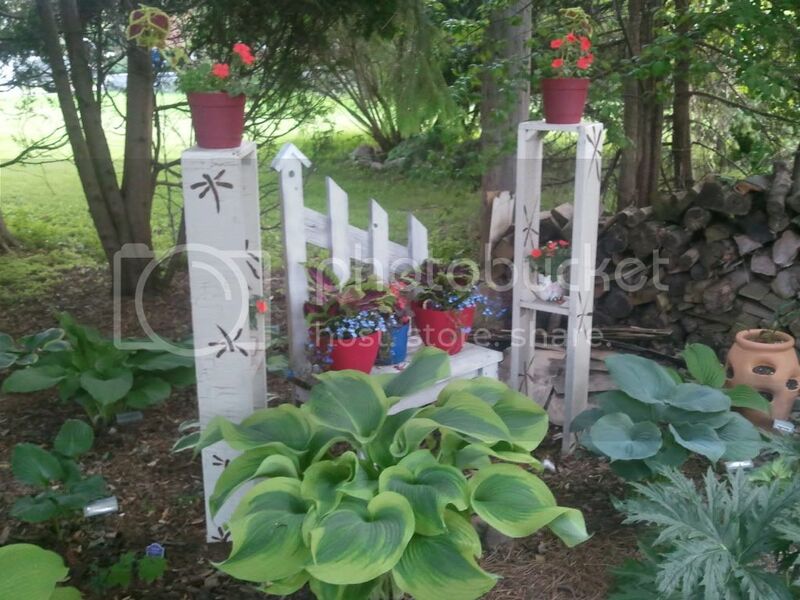 The blooms are white and are held close to the hosta. Not sure if you have an Elegans, you can usually tell by the bloom time. Flowers are white and held close to the hosta. It blooms very early in summer. In spring the leaves are more of a blue-green color. As summer progresses the waxy blue of the leaves will be replaced with more green.